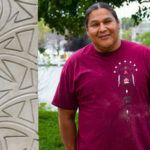 Anishinaabe Artist Jason Quigno was born in 1975 in Alma MI. Working in all types of stone and and always evolving pushing the limits of the stone and of himself Jason strives for simplicity, movement, balance and beauty in each sculpture. Jason Quigno can take a heavy block of hard, rigid stone and turn it into a seemingly weightless series of flowing forms, curling and interlocking with a distinct sense of movement. While he polishes the surface of certain pieces to a smooth, shiny finish, at times he chooses to expose the stone's raw texture, or to meticulously etch one side, highlighting the apparent flow of something as unyielding as stone. When I create I am always pushing myself, my designs and the limits of the stone to bring out a fluid and balanced form, and to create artwork that is graceful, delicate and has a sense of movement. You don't think of stone as having these qualities but these are some of the things I strive for in my work.